The CIR-II is a very simple Infra-red interface device. It connects to your PC's parallel port and enables control of any IR device from your PC. The CIR-II is based on the original CIR from ZipLabel with possibilities for modifications based on changes published by Skibum in his PCIR project. Both versions can be assembled from the PCB available from Midon Design. Midon Design ships an assembled and tested unit based on the original CIR design. NOTE: the software required to use this device is available from ZipLabel. Midon Design will not provide software support of any kind. We are making the hardware available as is for Home Automation enthusiasts unable, or unwilling, to construct the unit on their own. It should be further noted that this hardware is KNOWN not to work with Windows 2000 and WinXP PC's due to the method in which those operating systems prevent direct access to low-level hardware signals. Acknowledgement: Midon Design wishes to thank Earle at Ziplabel for his kind permission to provide the finished hardware to the HA community in this fashion. The schematic below shows both versions of the CIR, the original and the subsequent PCIR version. In both versions, we have added a visible light LED to the output port to facilitate trouble-shooting and set-up. Both versions have 2 different sections, the Receive and the Transmit circuits. The Receive circuit in both is identical. Q3, an IR Phototransistor, is used to receive IR transmissions. They are passed directly to pin 13 of the PC's parallel port, labeled as +SELECTIN, and pin 3 of the parallel port, labeled as DATA1. The PC software reads this pin and translates the received on/off IR beam into suitable codes. The Transmit section of both versions are very similar. Details of the differences are discussed below. The Transmit section receives on/off pulses from the DATA0 (pin 2) pin of the PC parallel port. These, in turn, directly enable or disable the IR LED's connected to transistor Q1, as well as the visible LED connected to transistor Q2. The resulting on/off IR beams emulate a hand-held remote control's codes and thusly trigger the desired equipment within line of sight. The differences in the 2 version's Transmit section are interesting. The original CIR has 2 high-efficiency LED's connected directly to a switching transistor via a resistor. The PCIR version uses only one high-efficiency LED connected to a switching transistor configured as an emitter follower. Both versions appear to function similarly, however, quantitative tests have not been performed on both to determine the merits of either design. 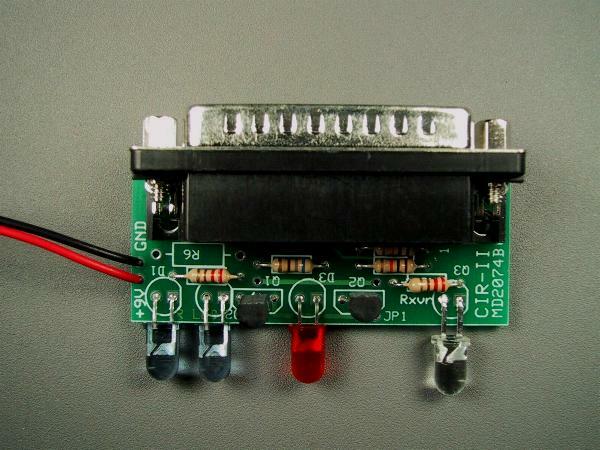 Connect a 9V battery (not supplied) to the battery clip on the CIR-II, then connect the CIR-II to your PC's parallel port. Install the PowerIR software available at ZipLabel and follow the directions for installation. There are also some "Common Problems" noted on the Ziplabel website. Check those for help if you have trouble getting the unit to work. You might also want to check the HomeSeer Message board for information published by existing users of the CIR and PCIR. Reminder: Midon Design will not provide software or user-specific support for this unit. Hint: did you know that all video cameras can "see" Infra-red light. If your equipment does not seem to work with CIR-II and the visible LED is working, check the IR LED emissions using a video camera.